Some images from a weekend of freedom for my youngins. A rare weekend where the freedom to play endlessly all day, and to carry on into the next availed itself. The tea party for many many toys, the many beds made for tired toys. 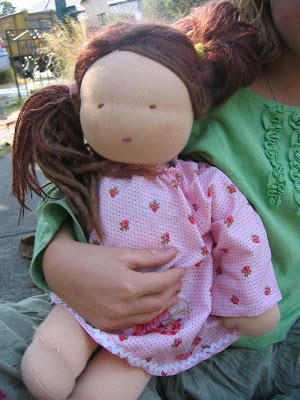 And even a sewing project started AND finished with chicken of 9yrs, who used her mini sewing machine for the first time since Christmas day, producing a most delightful dress for Caroline the handmade doll. 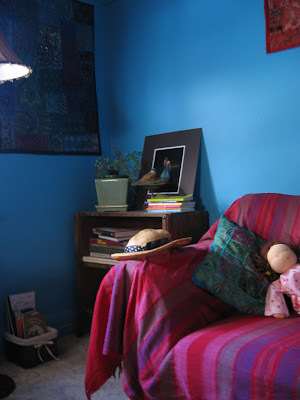 And a corner of my house, the new blue lounge room with warming soft interiors, has been a delight this summer. I love a blue room. It is tricky to get the right blue I think, but you've done it. 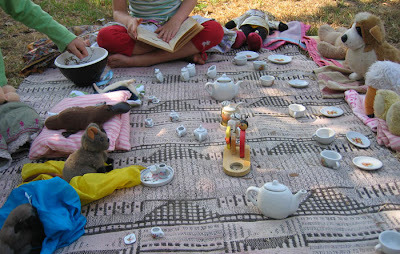 Lovely looking tea party too; makes me all wistful for wee children again.